Back in October, Matt and I made the tough decision to move out of our rented house into his parents’ spare room. We want a house of our own, and although we were saving while we were renting, it was going to take a long time to get the kind of money we needed for the house we wanted. So, we took a deep breath and handed in our notice on the house, and a month later, packed up our lives into my uncle’s garage, Matt’s nan’s spare room and whatever we could fit into his parents’ spare room. Going from a two bedroom house to one small room has been tough. Really tough. Arguments have been had, tears have been shed. If nothing else it has proved how strong our relationship is that we haven’t killed each other yet 😉 One thing that we’ve had to work around is our different work schedules, as I work a 9-5 office job and Matt works in manufacturing on a 3-shift rotation which means some days he will be going to bed as I’m waking up, or he wants to go to sleep pretty early whereas I’m still wide awake. I’d been using my iPhone earbuds with my tablet to watch TV shows whilst he slept, but after a while my ears were sore and wearing the earbuds was pretty uncomfortable. When I was offered a pair of SleepPhones to try, I was super excited as they were just what I’d been looking for. Pyjamas for your ears – yes please! SleepPhones come in a variety of colours and styles – wired and wireless. I was sent the wired version, where the virtually flat headphones are encased in a cute lavender band. The headphones are removable so you can wash the band, fitting is a standard 2.5mm jack so should work with pretty much all devices and I was sent size medium which fit me fine. The sound quality is good, and the little volume switch on the side of the cord is a nice feature. One thing to bear in mind – if you have them on full volume there may be some noise transfer to anyone next to you, however Matt’s a pretty heavy sleeper so that isn’t a problem for me. 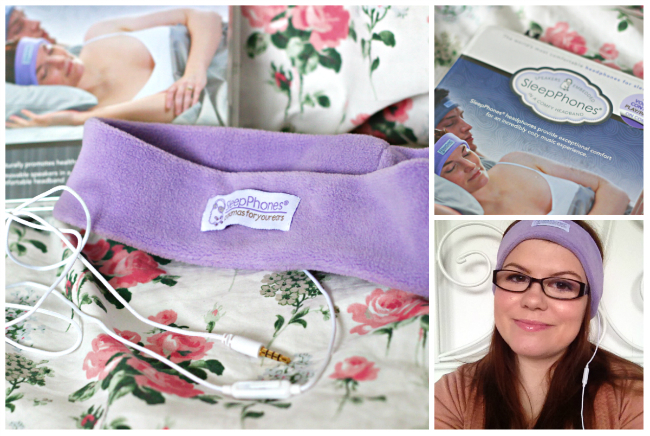 I’ve really enjoyed using the SleepPhones – no sore ears to be seen, the fleece band is soft, lightweight and comfortable and I can even lie on them with absolutely no discomfort from the headphones digging into my ears. The band can also be positioned so that it becomes an eye mask which can help if you have trouble falling asleep when there is light – these would be perfect to take on a long flight. Matt said he’d like a pair of the ones designed for sport so they also get a thumbs up from him! For me personally the only downside to the SleepPhones is the price. This particular pair retail at £29.99, and although I think they are great, I do feel that they are little expensive for what they are. However if you have the money and are in need for them like I was, I’d definitely recommend them! Want some? You can buy them direct from SleepPhones or from Amazon if you prefer. * All prices correct at time of writing. Product sent free of charge for review purposes.